We all like a ‘goal-fest’. Lets face it, what’s not to love about a thrilling 3-3 draw? Even if it was your side that gave away a three-goal lead at half-time you can still savour the fact that you were there to witness the six goal thriller. That would probably have been the consoling thought for Nottingham Forest fans as they left the City Ground on Boxing Day 1963 having seen Sheffield United come back from 3 down to grab a point. They had seen the game of the day surely? But then they would have seen the other results roll in from around the country (or maybe picked up their Sunday papers, no internet back then folks!) Another 3-3 at Molineux, 1-5 at Bloomfield Road, 6-1s at Turf Moor and Anfield, 4-4 at The Hawthorns, 2-8 at Upton Park! 10-1 at Craven Cottage!! 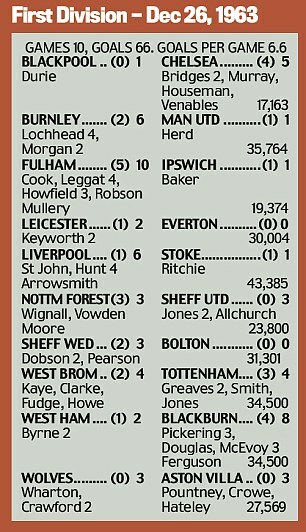 Yes, Boxing Day 1963 really was the day it rained goals in the First Division. Ten matches, 66 goals and only two teams kept clean sheets (step forward the defences of Leicester City and Sheffield Wednesday, hang your heads the Everton and Bolton forward-lines). 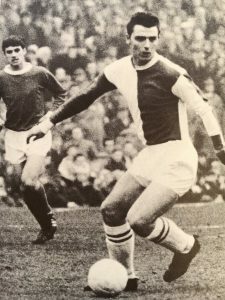 Fred Pickering of Blackburn Rovers (with a promising youngster in the background). Did he get the match ball? It was the forwards who took the plaudits. 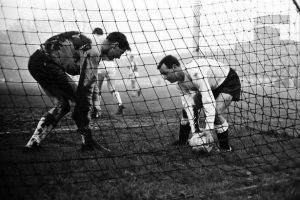 Fred Pickering and Andy McEvoy of Blackburn Rovers must have fought over the match ball after both got hat-tricks in their team’s 8-2 thumping of West Ham United in London. 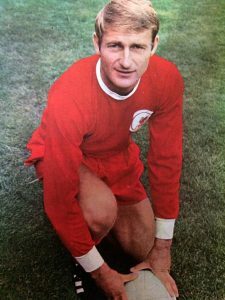 Andy Lochhead smashed in four in Burnley’s 6-1 hammering of Manchester United and Roger Hunt managed the same feat as Champions-elect Liverpool swept Stoke City aside by the same score. Graham Leggat helps retrieve the ball after completing his hat-trick. There was one more to come. Bobby Howfield only got nine goals during his time at Fulham but three came in the 10-1 thrashing of Ipswich Town. Match ball? No chance, Graham Leggat hit four in the same match. As was often the way in those days, the reverse fixtures were played two days later. For some, revenge was quick. West Ham turned things around to win 3-1 at Ewood Park, Ipswich turned the tables with a 4-2 with over Fulham and Manchester United almost eked out an ‘aggregate draw’, thrashing Burnley 5-1. 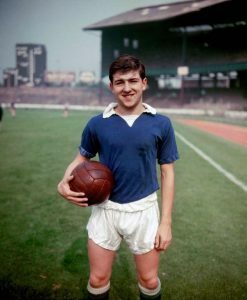 There were only the ten games played in the then-22-team First Division due to postponement of the fixture between Birmingham City and Arsenal. 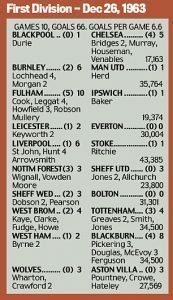 When that game was played the London club ran out 4-1 victors to almost keep the six-a-game goal average up! 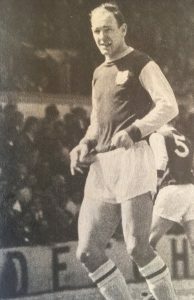 Many have claimed that Yuletide overindulgence may have been part of the reason for the avalanche of goals but players of the time, including Ian St John, hotly deny this. We’d prefer to believe that instructions in the game back then were to score, score and score again. And on December 26th 1963 the players on duty certainly took those orders to heart!